On Friday it was Mary’s Birthday. 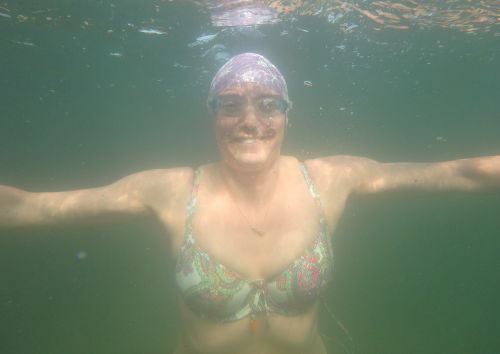 There being an icy blast coming straight from Siberia, and the water 3.5 degrees and dropping, she dressed appropriately for the occasion of a birthday swim. A bikini with tassels, of course! To those unfamiliar with the place, this is of course Clevedon Marine Lake. The water isn’t often this green, it’s generally muddier, but on this occasion it was even clear enough for underwater photos. This entry was posted in digital, showcase, swimming and tagged art, Clevedon Marine Lake, cold water swimming, digital, drawing, open water swimming, swimming on February 26, 2018 by Nancy Farmer.